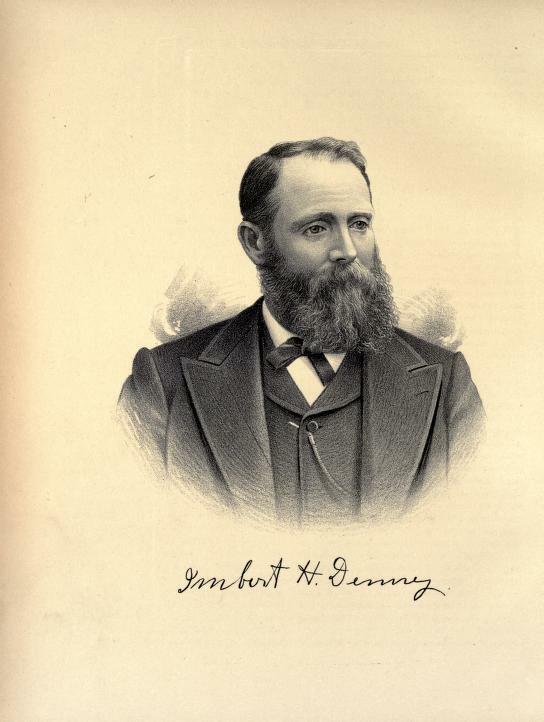 IMBERT H. DENNY. Our subject is one of the older inhabitants of Bond County, of which he is a native. He was born January 11, 1835, upon the farm in Shoal Creek Township where he now lives and where he carries on an extensive business in general farming and stock-raising. He is a son of Robert Wilson and Eleanor (Finley) Denny. Grandfather Denny was an Irishman by birth and when quite young came to America, settling in North Carolina, where Robert Wilson Denny was born. Our subject's mother was of Welsh ancestry, her father having emigrated from Wales and settled in Tennessee, but the exact time of their coming to this country or even the date of her birth is not known to us. In 1820 our subject's father and grandfather came to Illinois, the balance of the family coming hither in 1828. They first settled on the farm where our subject was born, and there both grandfather and father died, the latter about 1845. Mr. Denny's mother lived until 1889, and died in Kansas at the age of eighty years. Our subject is the eldest of a family of five boys, of whom four are now living, namely: J. B. who lives on an adjoining farm; Robert W., who is an extensive miner in Mexico but resides at Newton, Kan.; and P. B., who lives at Walshville, this State. All four of these men did excellent service in the late war. He of whom we write grew up on his father's farm and received the advantages common to the agricultural class of his day and locality. July 7, 1861, Mr. Denny enlisted in the army, joining Company E, of the First Illinois Cavalry, under Capt. Paul Walters. He was taken prisoner at Lexington, but was released on parole. He was not, however, exchanged until his term of service was out, when he was discharged. While the war was still in progress, our subject married Miss Emily Bowen, a native of Springfield, Vt. She died four years later, leaving one daughter, Nellie R., who married Charles A Fellows, of Buffalo, N. Y.
Mr. Denny has been a farmer all his life but has other interests in which he has money invested that bring him a handsome income. He was one of the original stockholders in the Sorento Coal Company, in which he is at the present time a Director, he was instrumental in getting the right of way for the two railroads that cross at Sorento, and has always given freely of his time and ability to whatever cause appeared to be for the benefit of the community. The second marriage of Mr. Denny took place February 28, 1871, the lady of his choice being Miss Melinda Armstrong, of Montgomery County. There have been eight children born to Mr. and Mrs. Denny: Emily J. and Hattie May were both educated at the Lincoln University; James Imbert is now at school at Sorento, as are Pearl, Hilda and Fay. Marcia E. and Herschel A. are deceased. The father of Mr. Denny was a school teacher of some note in his day and served as County Commissioner and County Clerk. He was one of the Associate Judges of the county and for many years acted as Justice of the Peace. Extracted 20 Dec 2016 by Norma Hass from 1892 Portrait and Biographical Record of Montgomery and Bond Counties, Illinois, pages 274-275.